Home The FOLIO Portrait Demonstrations: I’d Rather Take The Leap Than Stand Still. Chantal Lynn Barber feels like she is living a second life when she looks at how her painting style has changed from its tight beginnings. “I paint people because I truly love people,” she said. “I want a chance to connect and learn. The main thing is that whatever I do or say up here on the canvas is who I am.” Most of the artists in the room could relate to this as she shared thoughts about her chosen medium, the process of making art, selling art, social media, and other things that have inspired and challenged her. Originally from San Diego, she started painting in acrylics when very young and was largely self-taught. 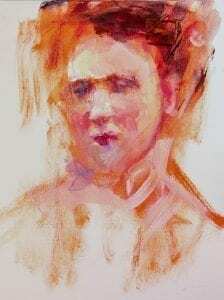 Influenced by a perfectionist mother, her technique developed into a tight and detailed style that was successful at reproducing a likeness but left her wanting more. 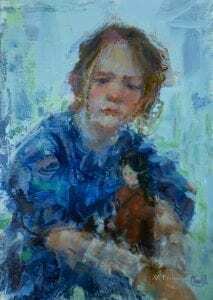 She transitioned into oils, but when she became a Navy wife and had to move frequently, working in oils became a challenge. The logical solution was to return to acrylics, but then she faced an unexpected obstacle—medium prejudice. An example of Barber’s expressive style of work. Barber’s demonstration portrait for the PSA audience. During her painting demonstration, Barber talked about both her technique and materials. She likes Golden and Liquitex heavy-bodied acrylics and does not use mediums or extenders. Her canvas or gesso board is toned with a neutral gray and for the demo, she began with a transparent red oxide. “I want to be constantly drawing as I’m painting, refining, and making the drawing more accurate,” she remarked as she worked. Mixing a medium flesh tone, she began adding more color to the painting, remaining constantly aware of the values and temperatures of each color, while working with a limited palette in order to mix accurate and vibrant colors. Acrylic paint dries one value darker, so it requires a little getting used to. “I control the values on my palette which enables very soft transitions,” she says. She started with a pile of darker paint, then lightened it to create more values. Employing a dry-brush technique she also will use paper towels, rubber spatulas, and anything else that will make the desired mark.